Wallie Valentine Funk, "I have had very few dull moments in my life." Wallie Funk once said, "I have had very few dull moments in my life." Funk, a newspaper publisher, arts advocate and a man who loved Anacortes, passed away on August 12, 2017, at age 95. His family assumes his afterlife will be no less dull. Wallie Valentine Funk Jr. was born in Anacortes on April 29, 1922, to Wallie Valentine Funk Sr. and Irene Brown Funk. That he died in his hometown more than 90 years later speaks to the grip its artists, fishermen, Croats, refinery workers and Anacortes Seahawks sports teams had on his soul. His favorite smell was of salt water and creosote at the port dock. Funk's interest in newspapering started early, in the mid - 1930s. To pass the hours he assembled scrapbooks recording seasons of Seattle Rainiers' baseball, University of Washington football and more. His first sports story was written after Anacortes beat Bellingham 3 - 0 in football. He wrote it by hand, then glued a splinter from the goalpost to his copy as a final touch. Funk graduated from the UW. Like so many of his generation, he interrupted his studies to serve in World War II. He carried shrapnel in his hand from a small wound suffered at Leyte Gulf, but was otherwise uninjured. The post-war UW was a remarkable place; its influence on a small-town man profound. Funk sometimes attended classes, usually journalism. His highest education came from the Sigma Nu fraternity; the UW Daily student newspaper and student government. As senior class president, he served with such future leaders as Wing Luke, Martin Durkan and Brock Adams. Home beckoned in 1950. Starting a business relationship that would last until 1988, Funk and fraternity brother John Webber bought the Anacortes American, a daily newspaper with a circulation so small that the Associated Press didn't bother charging for its service. 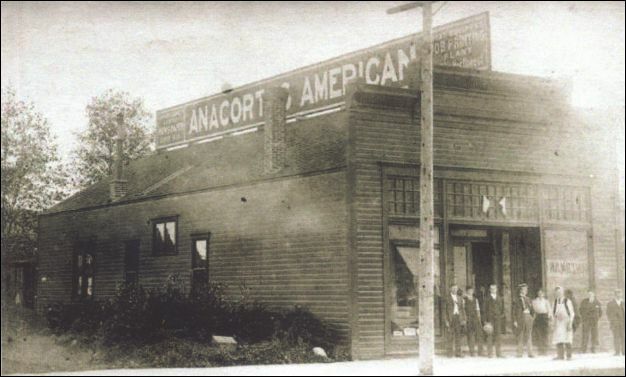 Funk's first editorial: A call for an Anacortes history museum. Love beckoned, too. Mary Ann Ringwall was a high school teacher newly arrived from Waitsburg, WA and Columbus, ND. They met dancing at the Elks Club. But Funk nearly let Mary Ann get away. It was "Marry me or I go teach in Turkey." They wed in 1954. Within three years they had two sons, Mark and Carl. Funk was an unapologetic homer when it came to high school sports. Local referees once gave him an embroidered crying towel. He never got over the back-to-back state championship losses Lincoln of Seattle dealt his Seahawks basketball team. Said Funk: "I hated Lincoln . . . I hated the referees . . . I hated . . . the air . . . in the ball." Funk used the newspaper to advocate for his vision of Anacortes. The American campaigned vigorously for better schools, roads and infrastructure. If you opposed these good things (and the tax increases) you were a "no-good-nick." Establishing the Anacortes Arts and Crafts Festival was a very good idea, indeed. In 1961, Funk and lifelong frien d Dr. Eugene "Bud" Strom, were in Miami Beach, FL, to accept an All-America City award for Anacortes. Not everyone shared Funk's vision. In a town that could barely support one newspaper, a rival popped up. Coin jars were placed in taverns asking for donations to drive off the Four Fs: Funk the newspaper publisher, Fox the Chevy dealer, Fritz the radio station owner and French the city manager. Loss of advertising dollars proved decisive; Funk and Webber sold the American in 1963. At the same time, the Whidbey News-Times came up for sale. Funk continued his newspapering in Oak Harbor. Each edition was loaded with local names and photographs. On deadline mornings, reporters raced to Funk's home to pick up copy in what came to be known as "the pajama run," because that's what he was wearing. Funk likely was writing about politics. The American was the first state newspaper to endorse Dan Evans, a Seattle lawmaker running for governor. Evans later appointed Funk to the Washington State Arts Commission, a post he would hold under the next two governors. Skagit Valley artists infused Funk's life; Graves and Anderson, two of the so-called Northwest mystics, lived close by. He befriended so many others - Max Benjamin, Russ and Betty Frost, Phil McCracken, Ann McCool, Kevin Paul. Their works surrounded him until the end. Funk's own tool was the camera; a Leica or Nikon. He photographed NAS Whidbey sailors on the USS Enterprise's deck. He captured presidents from Johnson to Carter; the Queen of England; the Beatles and the Rolling Stones; and hundreds of school band concerts. His most important photos, though, were taken in 1970 at the Penn Cove orca roundup, pictures graphically capturing the iconic mammals' treatment at whale hunters' hands. The photos remain in worldwide circulation, an internet click away. 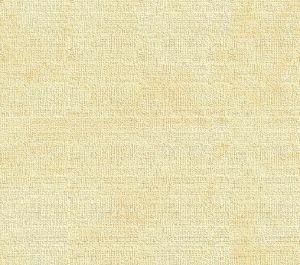 A family tree of newspaper people started with Funk. Several graduated to the Skagit Valley Herald, The Seattle Times, The Seattle Post-Intelligencer and the Everett Herald. The Wall Street Journal's London chief's first job was with Funk. Another alum holds two Pulitzers. Others rose to become weekly publishers in their own right. Funk presided over the Washington Newspaper Publishers' Association, a trade group of remarkable publishers. He enjoyed traveling to their homes; Lynden, Port Townsend, Stanwood and Waitsburg. WNPA friendships extend into the next generation. Mary Ann Ringwall Funk, a beloved wife, mother, grandmother and teacher, passed away on Friday, October 10, at Island Hospital in Anacortes, WA. Mary Ann was a life-long learner. She influenced the lives of so many students whom she taught in Waitsburg, Anacortes, Oak Harbor and, ultimately, as a trustee of Skagit Valley College. She challenged the best and brightest of her kids. She encouraged all her students to open their eyes and minds to the world beyond her classroom. And, quietly, she offered support and hope to those who needed it the most. Mary Ann was born October 28, 1926, on a homestead worked by her parents, Hjalmar and Rose Ringwall, in rural northwest North Dakota. She was the eighth of nine children in a large farm family. She rode horses as a girl, loved a good time at the Sons of Norway Hall and drove wheat trucks in World War II. A Columbus, ND, High School graduate, she earned her degree from North Dakota State University. She met her husband, Wallie Funk, in the Anacortes High School boiler room. They married on June 25, 1954. Together for 54 years, Mary Ann and Wallie, a local newspaper publisher in Anacortes and Oak Harbor, raised two sons, who live in Seattle. After having her children, Mary Ann returned to teach high school English for more than two decades in Anacortes and Oak Harbor. During that time, she was an active member of the American Association of University Women and the League of Women Voters. When she retired, Mary Ann was appointed to the Skagit Valley College Board of Trustees by state Sen. Mary Margaret Haugen. Obituary excerpt Mary Ann’s husband Wallie Funk survives her at the family home in Anacortes; he is a Past President of Skagit County Pioneer Association 1992.
playhouse, LaConner's Museum of Northwest Art; and, on the waterfront, the Northwest Center of Excellence for Marine Manufacturing & Technology. Almost every Anacortes High School class from the mid-1930s to the early 1970s regarded Funk as an honorary member. Funk was preceded in death by his wife, Mary Ann; and two brothers, Jim and Charlie Funk. The family sends out a special thank you to San Juan Rehabilitation's staff, particularly Agnes Haller, whose friendship extended beyond care. 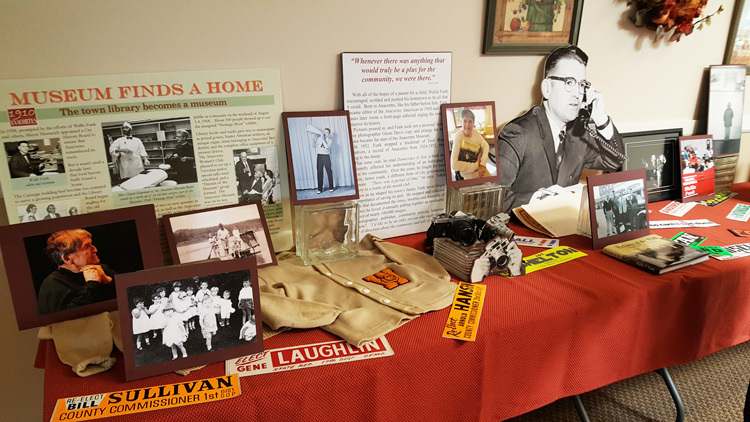 Funk was honored recently at Western Washington University, where thousands of his historic photographs have a home. He talked with the school's communications students. He told them, "Don't send flowers when I pass. Simply being here today, with you, is all the memorial I need." The family suggests honoring Funk's memory by subscribing to a newspaper (weekly, daily, doesn't matter); buying a copy of Funk's Pictures of the Past: Celebrating 125 Years of Anacortes History, proceeds going to the Anacortes History Museum; or, donating to the WNPA's Wallie Funk scholarship, which meets expenses for reporting interns covering the state Legislature. His acclaimed, museum-quality photo collection is just part of the lasting impression left by the late Wallie Funk. That's because the ever buoyant, always sunny newsman created a voluminous legacy in print that won't soon be eclipsed. If ever. 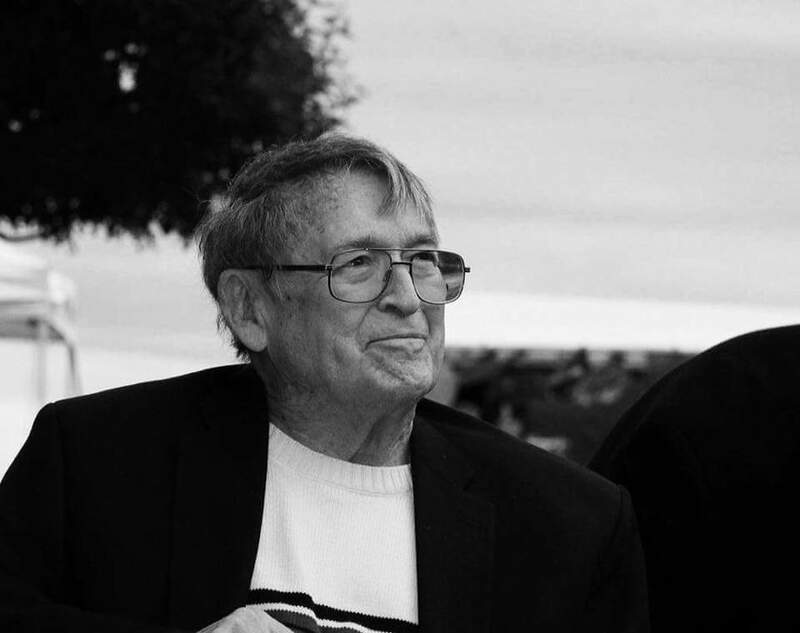 Funk, 95, died recently, succumbing to the infirmities of old age, but not before having breathed life into the work of two generations of Northwest reporters, editors, and photographers. His own life was one of perpetual motion. During Funk's storied publishing career and even later as a jovial and witty roving emeritus professor of community journalism---a labor of love that spanned more than four decades---he rarely, if ever, failed to lift the spirits of newsrooms in Skagit and Island counties and beyond. His many protégés include Midge Howard, who would emerge much like Funk himself as a tireless civic leader after having taught journalism at Skagit Valley College and reported for the Sedro-Woolley Courier-Times. "He would drop by occasionally to visit my boss, Gary Evans," recalls Howard. "One day I was lamenting having no ideas for a feature, and he told me to just knock on someone's door and start asking questions. "Everyone has a story, he said." He offered similar counsel during stops at the old Channel Town Press in La Conner, whose owner, Alan Pentz, grew up in Anacortes, as did Funk. 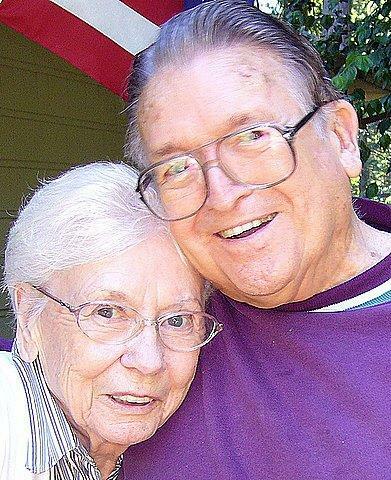 "In my mind," says his niece, La Conner Schools Secretary Connie Funk, "his ability to inspire and encourage others was the greatest of Wallie's many assets. "He would seek out people," she adds, "and take the time to compliment them and thank them for their contributions." Gale Fiege, of La Conner, now a widely-read reporter with the Everett Herald, was among those to have earned kudos from Funk, whom she ranks among the state's most inspirational newspapermen. Fiege still remembers Funk phoning to praise her for an arts feature she wrote while at the Skagit Valley Herald in the early 80s. His encouragement, Fiege said in a recent social media post, was always well timed. Funk's unique story, at least from the local angle he always sought, is deeply rooted in Anacortes. His grandparents arrived there from Germany in 1890. Funk would develop his lifelong love affair with journalism while a student at Anacortes High, where as a student reporter his first hometown Seahawks sports story remains a treasured part of family lore. Funk is said to have glued a splinter from the wooden goalpost to his hand-written account of an Anacortes football win over Bellingham. His college years found him at the University of Washington, whose School of Communications would eventually name Funk to its Hall of Fame. He made his mark as a UW student leader, rubbing elbows there with future U.S. Senator and cabinet member Brock Adams and veteran state lawmaker Martin Durkan. It was Durkan who U.S. Rep. Denny Heck famously described as "one of the best governors we never had," a line not unlike those that Funk regularly spun from home and office during his years co-publishing with business partner John Webber the Anacortes American, Whidbey News-Times, and South Whidbey Record. While championing local causes, Funk often belied his trademark glasses by showing uncanny foresight. He embraced historical preservation long before it was in style. Ditto environmental protection. Funk also vigorously championed the arts and, while in his mid-40s, saw the Beatles as more than the passing teen fad derided by some of his contemporaries. He became legendary for having snuck a camera into a live performance by the Fab Four in Seattle, coming away with priceless photographs that are now part of his amazing collection. Funk was a strong proponent, as well, of public education. He wed teacher Mary Ann Ringwell in 1954, not long into his tenure with the American. "They shared the same ideas, values, and passions," Connie relates, noting that Funk championed development of critically thinking, well-rounded students. "He was equally passionate about the arts," says Connie, "as he was with sports. He was hugely involved with and supportive of theater, music, language arts, and athletics." Funk saw learning as a lifelong activity and devoted much of his own continuing education to history. His classroom was the world he covered, and he literally left no stone unturned. Yet even into his 90s, Wallie Funk was very much a man ahead of his time. "He loved history," Connie explains, "and he greatly valued history, but he wasn't someone who lived in the past." Funk was also pretty astute when it came to economics. Consider that one of his best investments cost him just $25. That's how much he paid to salvage a truckload of negatives a popular Anacortes photographer was hauling to the dump. 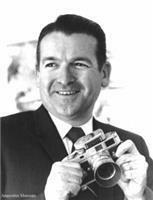 His own camera---like American Express, he never left home without it---also captured truckloads of images. Over the years, Funk photographed everything from U.S. Presidents and orca whales to high school graduations and military parades. He traveled the world as a member of various trade delegations, and in his role as a state arts commission member celebrated the many cultures he encountered on those trips. "He always looked for what we could do to enhance our common humanity while acknowledging we have different backgrounds and might have different opinions," says Connie. "One of the great things about Wallie is that he felt, at the end of the day, while people might have different political opinions they could still respect one another." On one point, all are agreed.